Open Access Annals of Human Biology (2018), Volume 45, Issue 1, with the title Human population genetics of the Mediterranean. Iron Age Italic population genetics: the Piceni from Novilara (8th–7th century BC), by Serventi, Panicucci, Bodega, et al. Background: Archaeological data provide evidence that Italy, during the Iron Age, witnessed the appearance of the first communities with well defined cultural identities. To date, only a few studies report genetic data about these populations and, in particular, the Piceni have never been analysed. Aims: To provide new data about mitochondrial DNA (mtDNA) variability of an Iron Age Italic population, to understand the contribution of the Piceni in shaping the modern Italian gene pool and to ascertain the kinship between some individuals buried in the same grave within the Novilara necropolis. Subjects and methods: In a first set of 10 individuals from Novilara, we performed deep sequencing of the HVS-I region of the mtDNA, combined with the genotyping of 22 SNPs in the coding region and the analysis of several autosomal markers. Results: The results show a low nucleotide diversity for the inhabitants of Novilara and highlight a genetic affinity of this ancient population with the current inhabitants of central Italy. No family relationship was observed between the individuals analysed here. Conclusions: This study provides a preliminary characterisation of the mtDNA variability of the Piceni of Novilara, as well as a kinship assessment of two peculiar burials. Reconstructing the genetic history of Italians: new insights from a male (Y-chromosome) perspective, by Grugni, Raveani, Mattioli, et al. Background: Due to its central and strategic position in Europe and in the Mediterranean Basin, the Italian Peninsula played a pivotal role in the first peopling of the European continent and has been a crossroad of peoples and cultures since then. Aim: This study aims to gain more information on the genetic structure of modern Italian populations and to shed light on the migration/expansion events that led to their formation. Subjects and methods: High resolution Y-chromosome variation analysis in 817 unrelated males from 10 informative areas of Italy was performed. Haplogroup frequencies and microsatellite haplotypes were used, together with available data from the literature, to evaluate Mediterranean and European inputs and date their arrivals. Results: Fifty-three distinct Y-chromosome lineages were identified. Their distribution is in general agreement with geography, southern populations being more differentiated than northern ones. 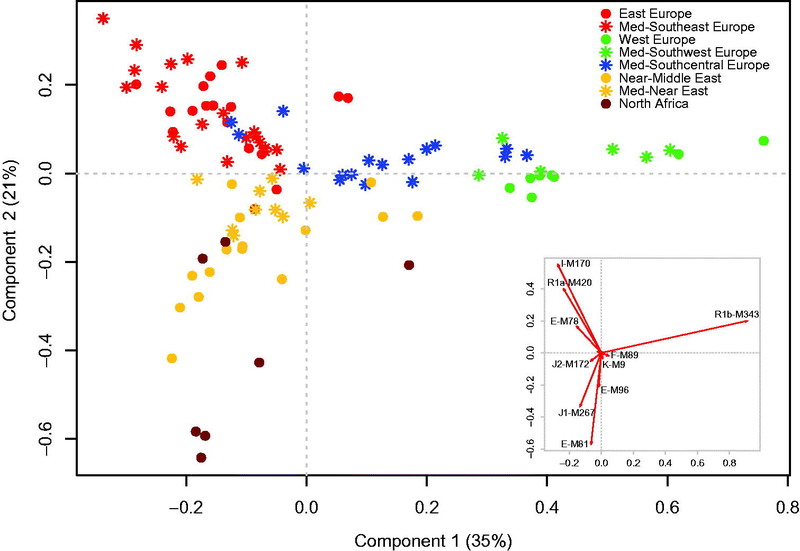 Conclusions: A complex genetic structure reflecting the multifaceted peopling pattern of the Peninsula emerged: southern populations show high similarity with those from the Middle East and Southern Balkans, while those from Northern Italy are close to populations of North-Western Europe and the Northern Balkans. Interestingly, the population of Volterra, an ancient town of Etruscan origin in Tuscany, displays a unique Y-chromosomal genetic structure. Frequencies of the main Y-chromosome haplogroups E1b, J2 and R1b and their sub-clades in the 10 analysed Italian population samples. Black sectors in the primary pies are proportional to the frequency of the main haplogroup in each population. Coloured sectors in the secondary pies are proportional to the frequencies of sub-haplogroups within the relative main haplogroup. Mitochondrial variability in the Mediterranean area: a complex stage for human migrations, by De Angelis, Scorrano, Martínez-Labarga, et al. Context: The Mediterranean area has always played a significant role in human dispersal due to the large number of migratory events contributing to shape the cultural features and the genetic pool of its populations. Objective: This paper aims to review and diachronically describe the mitogenome variability in the Mediterranean population and the main demic diffusions that occurred in this area over time. Methods: Frequency distributions of the leading mitochondrial haplogroups have been geographically and chronologically evaluated. The variability of U5b and K lineages has been focussed to broaden the knowledge of their genetic histories. Results: The mitochondrial genetic makeup of Palaeolithic hunter-gatherers is poorly defined within the extant Mediterranean populations, since only a few traces of their genetic contribution are still detectable. The Neolithic lineages are more represented, suggesting that the Neolithic revolution had a marked effect on the peopling of the Mediterranean area. The largest effect, however, was provided by historical migrations. Conclusion: Although the mitogenome variability has been widely used to try and clarify the evolution of the Mediterranean genetic makeup throughout almost 50 000 years, it is necessary to collect whole genome data on both extinct and extant populations from this area to fully reconstruct and interpret the impact of multiple migratory waves and their cultural and genetic consequences on the structure of the Mediterranean populations. 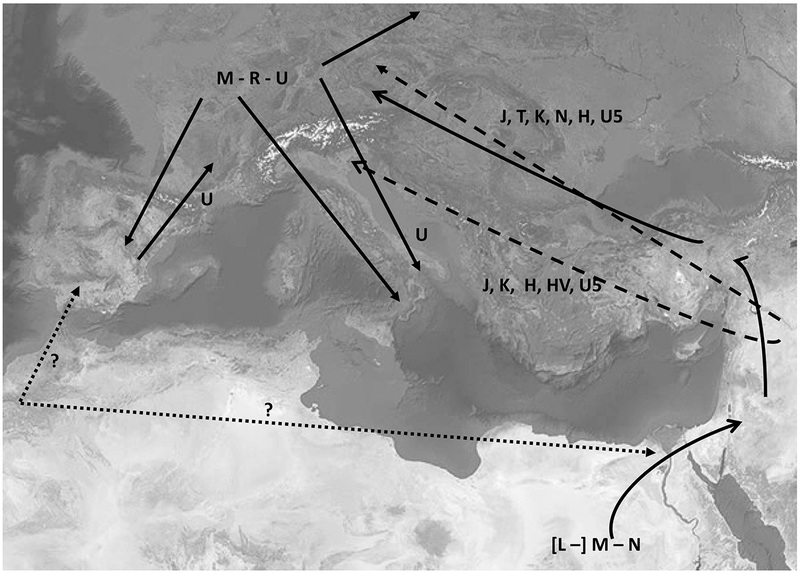 Major migratory routes with the associated mtDNA haplogroups for the Upper Palaeolithic (solid lines) and the Neolithic (dashed lines) chronologies. Other hypothetical migratory routes are presented with dotted lines (see text for more details). Mediterranean Y-chromosome 2.0—why the Y in the Mediterranean is still relevant in the postgenomic era, by Larmuseau & Ottoni. Context: Due to its unique paternal inheritance, the Y-chromosome has been a highly popular marker among population geneticists for over two decades. Recently, the advent of cost-effective genome-wide methods has unlocked information-rich autosomal genomic data, paving the way to the postgenomic era. This seems to have announced the decreasing popularity of investigating Y-chromosome variation, which provides only the paternal perspective of human ancestries and is strongly influenced by genetic drift and social behaviour. Objective: For this special issue on population genetics of the Mediterranean, the aim was to demonstrate that the Y-chromosome still provides important insights in the postgenomic era and in a time when ancient genomes are becoming exponentially available. Methods: A systematic literature search on Y-chromosomal studies in the Mediterranean was performed. Results: Several applications of Y-chromosomal analysis with future opportunities are formulated and illustrated with studies on Mediterranean populations. Conclusions: There will be no reduced interest in Y-chromosomal studies going from reconstruction of male-specific demographic events to ancient DNA applications, surname history and population-wide estimations of extra-pair paternity rates. Moreover, more initiatives are required to collect population genetic data of Y-chromosomal markers for forensic research, and to include Y-chromosomal data in GWAS investigations and studies on male infertility. Two-dimensional plot of the PCA of Y-chromosomal haplogroup frequencies of modern populations from Europe, the Near and Middle East and North Africa. Symbols are as in the legend. The inset shows the plot of factor coordinates of the variables used. We are clearly seeing in the latest genomic papers that Y-DNA was indeed extremely important to assess ancient population movements.